Come enjoy the best bouldering near San Diego at Mt Woodson. Mount Woodson is the most popular and classic place to boulder in San Diego, and there are good top-rope routes on quality granite as well. There are endless boulders of every shape and size as far as you can see, and there is a fire road winding through the boulder field, giving easy access to the routes. This is a well-developed area, with over 250 total routes between bouldering and roped climbing, though there's not much in the way of sport routes (but there ARE a wealth of top roping options). All levels of climbers will have fun here, but especially bouldering enthusiasts - there are over 60 problems in the V0 - V2 range, with the toughest ones reaching V12. Take Hwy 8 to the 67. Go on the 67 for approximately 17 miles. When you get to the Poway Road junction 14 miles from Hwy 8 continue 3 more miles on the 67. 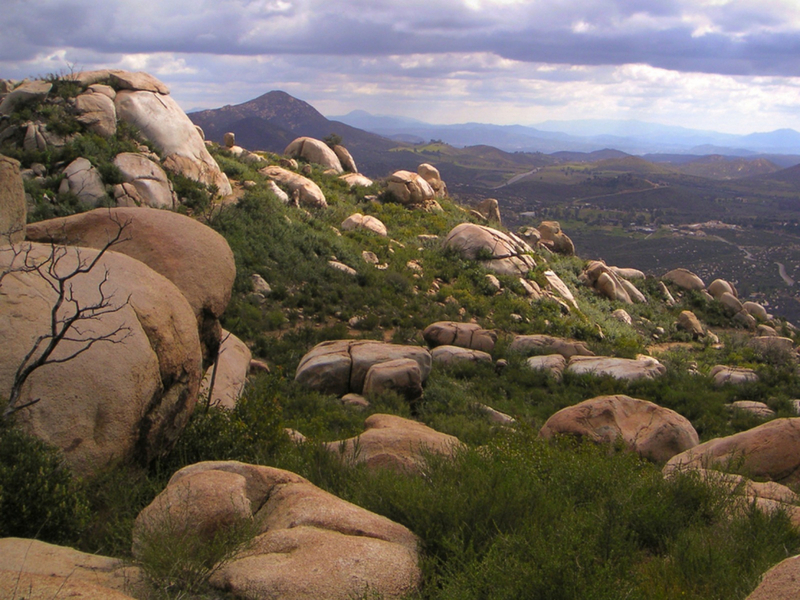 You will see Mount Woodson littered with boulders on the left side of the road.There is parking along the 67 near the Forest service fire station.